During his early in his life, Larry Montoya grew up among his Hopi tribe but felt pressure from outsiders off the reservation and throughout his education at a Nevada boarding school to avoid speaking his native language. “They didn’t want us to do our spiritual, cultural beliefs,” recalled Mr. Montoya. At age 79, he has a renewed focus on his language and preserving the service of his ancestors who turned their language into a key advantage for American troops on the battlefield during both world wars. Fellow members of Montoya’s Hopi tribe were among the men who used their native tongue to send coded messages on tactics and troop movements that no enemy troops could break. “I want people to know…what the Native Americans…how they were treated, but at the same time we fought for our families, not only our families but for everybody living in the United States,” said Montoya. He has shared their contribution to America’s Armed Forces during speeches and in conversation to anyone who showed interest. 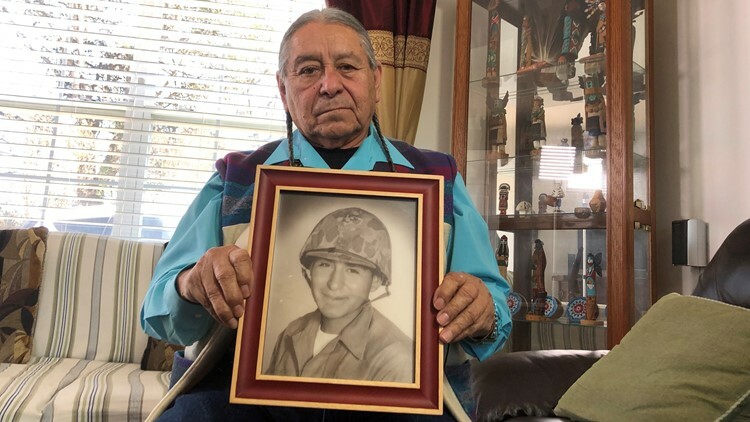 “There were 36 tribes that were code talkers during World War II,” said Montoya, paging through a personal scrapbook that honors their efforts to help with the war. In recent years, he took his stories about them to a broader audience. The producer of the documentary film “Never Broken” credits Montoya with helping research and offer first-hand accounts from his ancestors about their experience sending secret codes during war time. Military service holds a sacred place in Montoya’s family tree. His sons and grandsons are pictured in their dress uniforms on a prominent wall in his home, and the now 79-year-old volunteered to serve for a decade himself in the United States Marine Corps. “Before we were citizens of the United States, we were fighting for our country,” said Montoya, who also took time to answer, by email, the following 10 Questions about the impact his military service has had on his life. 1. What one person influenced you most in life? 2. Do you feel honored and respected for serving your country? Yes, I feel honored and respected by other veterans only when I am wearing something of the Marine Corps, like my cap. 3. How can people thank you for your service? Just a “Thank you for your service” will do. 4. How do you honor your fellow men and women? 5. How do you think this generation of service men & women is different or similar to yours? 6. What influence did your military service have on the rest of your life? Be a leader, respect and help others. Honor and defend my Country. As I grow older I continue to push myself, as told by my elders, and when you believe in what you want to accomplish continue to strive for it. 7. Does your family have a history of military? Yes, we do. Starting with our grandfather. 8. Would you encourage your son, daughter or other younger generations in your family to join the service? Most certainly, always defend our Country. 9. After seeing it and living it, how has your opinion of war changed? All things have a right to live and all things have a life. “BUT” when told to defend my Country, I will gladly do so. “Changed?” Difficult to answer, however, My Country< America, comes first. 10. How did your military experience shape your religious faith? Some what, My faith growing up on the Hopi reservation is strong. We learn to connect with our Creator at a young age.